"ERC.456 - 7 SORROWS of MARY - antique, Europe/unknown - (.75 in.)" 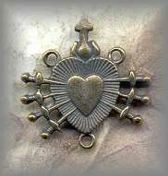 ||||| SEVEN SOROWS OF MARY: The pierced heart with seven swards symbolizes the 'seven sorrows' of Mary, a very old symbol of the church.Useful for any rosary dedicated to her seven sorrows or for the chaplet of the seven sorrows. ||||| ABOUT OUR METALS: All metals are hand cast from antique and vintage pieces in in sterling and solid bronze then antiqued to restore original patina.